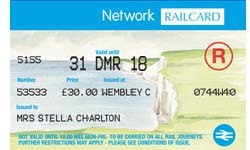 The Network Railcard is for anyone aged over 16 and allows &frac13; off standard Off-Peak and Anytime tickets for travel in the Network Railcard area. It is valid for one year, costs £30 and can be bought online. With your Network Railcard you can take up to three adults with you and they also get up to &frac13; off their rail fares. Plus, you can take up to four children (aged 5 to 15) and save 60% on the child fares. You can purchase or renew your Network Railcard online and your Network Railcard doesn’t just save you money on travel, it also saves you money with Railcard partners too – on days out, museums, hotels and more. Discounts also apply to Travelcards (restrictions apply), plusbus, some rover and ranger tickets and journeys to the Isle of Wight.